The seeds of the modern NFL, with its heady mix of athleticism and chess-level strategy, can be found in the 1980s, and any examination of the 1980s will inevitably include three coaches who won a combined 9 out of 11 Super Bowls between 1981 and 1992: the San Francisco 49ers’ Bill Walsh, the Washington Redskins’ Joe Gibbs, and the New York Giants’ Bill Parcells. Different as their styles and strategies were, all three men were driven, often to unhealthy extremes, to win, and their achievements are the focus of Bob Glauber’s engaging Guts and Genius. 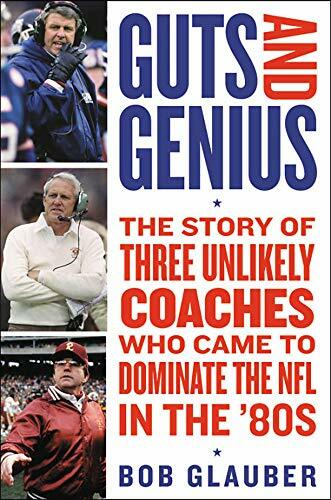 Utilizing present-day interviews with Parcells, Gibbs, and Bill Walsh’s son Craig (Bill Walsh died of leukemia in 2007), as well as recollections of former players, fellow coaches, and other journalists, Glauber, himself a veteran football reporter from Newsday, produces a concise, knowledgeable recap of all three coaches’ careers, and how they placed their stamp on football, with their disciples still winning championships to this day. It would easy to pigeonhole each coach (Walsh the professorial genius, Parcells the brash motivator, Gibbs the cool-headed schemer), but Glauber makes the case through numerous anecdotes that all three men combined tactical acumen with motivational fire to lead their teams to success. The roly-poly Parcells may have been known as “Tuna,” a “just one of the guys” coach who knew how to fire up his players, but he could also formulate superior game plans to outmatch his opponents. While Walsh was an unequaled innovator who perfected the West Coast offense that is still in widespread use, he also had the ability to inspire his team with a sly sense of humor (in one of the book’s more memorable moments, Walsh masquerades as a bellhop to relax his 49er squad before their first-ever Super Bowl appearance). And though Gibbs was pegged as a mild-mannered tinkerer who could adapt his strategies to fit his players’ skills, underneath his calm demeanor was a fierce competitor who spent days and nights in the office, outworking his peers. Moving chronologically, Glauber devotes individual chapters to each coach in round-robin fashion, documenting their challenges and eventual triumphs. In the process, he demonstrates how talent, luck, and opportunity collide to make history, and illustrates the fine line between success and failure, as all three coaches must overcome near-disastrous starts to their careers to achieve greatness. Glauber opts for an old-fashioned approach to his subjects, concentrating on their personal trials and the pivotal games that brought them fame, rather than the schematic X’s and O’s that characterize football discussion in our analytics-crazy era. Throughout all the highs and lows, we’re made keenly aware of the emotional and physical toll of the profession, as Walsh, Parcells and Gibbs all arrive at the final melancholic reckoning every coach’s face: the moment when the joys of winning no longer outweigh the pain of losing. All three coaches get equal due in Guts and Genius, but it is Walsh, the one coach Glauber did not have the opportunity to directly interview, who ironically emerges as the most compelling personality. Confident in his approach yet forever plagued by insecurity, soft-spoken but laser-sharp, an intellectual man in a game of brute force, Walsh stands in stark contrast to gruff football coach stereotypes, and Glauber does an admirable job of getting into his head during his unlikely rise from overlooked assistant coach to Football Hall of Fame inductee. If Glauber’s work is a bit light on depth—Parcells, Gibbs, and Walsh’s careers are all worthy of individual tomes, of which several have already been published—it remains an engrossing take on how all three men carved out their own niche as they competed against each other, and transformed the NFL in the process. Those seeking an introduction to a pivotal era in pro football’s history, and the three legendary coaches from that decade whose influence is still felt today, will find Guts and Genius to be a lively, entertaining reference.